EXIGO | Management Consultants, LLC. EXIGO’s mission is to collaborate with innovative healthcare companies to generate new revenue streams and optimize existing ones through information-based consulting on commercial challenges. Tatical focus on informational needs. Survey research is the solution set. Staff of industry and issues experts. EXIGO is the intersection of market research and management consulting. We are unique in providing the excellence of strategic thinking found in high-end consulting firms with the excellence in research technique found in sophisticated marketing research firms. In essence, we excel in information-based consulting. Experienced in all therapeutic areas, including oncology, rare diseases and emerging therapeutics, and in wellness issues. Address all customers from patients and caregivers to key opinion leading clinicians and scientists, health system executives to payers, vendors to senior management in industry. The reasons companies work with EXIGO are embodied in our process. Consumer, pharmaceutical, and device products. In market research, R&D, marketing, strategic planning, medical education, anthropology/ethnography, nursing and hospital finance. We work collaboratively with clients to leverage our experience and expertise to the benefit of every engagement. Leveraging knowledge of key client personnel along with our own. Thorough analysis of all client and external information to ensure all possibilities are in the considered set. Address each business issue in the manner that best meets client needs. Multiple solution sets, including primary research. Primary research that utilizes both traditional and more novel lines of inquiry. Work collaboratively with internal teams and other agencies (e.g., specialized consultancies, advertising agencies, market research vendors, social media providers). Expert in accessing challenging customer groups. Exceptional expertise and experience in conducting qualitative research for deep customer understanding. 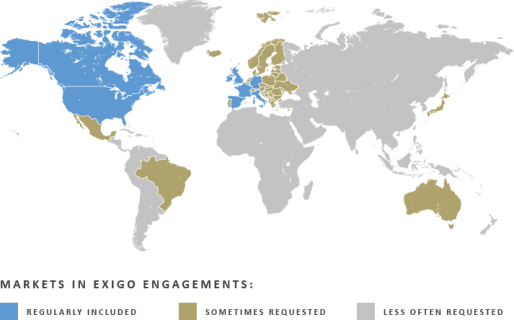 International partners extensively trained and closely guided by EXIGO consultants. Utilize innovative technologies as appropriate to meet engagement needs. Committed to giving our best thinking and interpretation, grounded in experience and applied to new knowledge generated. All analyses are based on 100% qualitative and quantitative data capture, not just notes or impressions. The results and thinking are transparent to enhance ownership and internalization. Analysis only by senior consultants who have the expertise to develop true insights, and, importantly to frame actionable business recommendations. Fill out the form below and we will get back to you as soon as possible. If you'd prefer you can call us at 609.924.6924.